Affordability and personalized education are two key initiatives that have thrived under Pitt's 18th chancellor. Ruling says organizers did not collect cards from 30 percent of bargaining unit; union disputes this claim. Hearing aid coverage added; enrollment period runs April 24 to May 15. Regionals don’t fare as well in annual AAUP Faculty Compensation Survey. Return to Majors-era colors and introduction of new Panther logo revealed; NFL great Donald announces gift. Faculty Affairs Committee hears complaints about pay, promotions and contract renewals. Interactive site gives 360-degree views of campus and can provide directions. Voting by Faculty Assembly members takes place between April 24 and May 6. Selected faculty and courses will try out the Blackboard replacement, Senate committee told. Bioengineering professor finds studies show negligible weight loss but there are other benefits. Construction could get started later this year on 110,000-square-foot space. 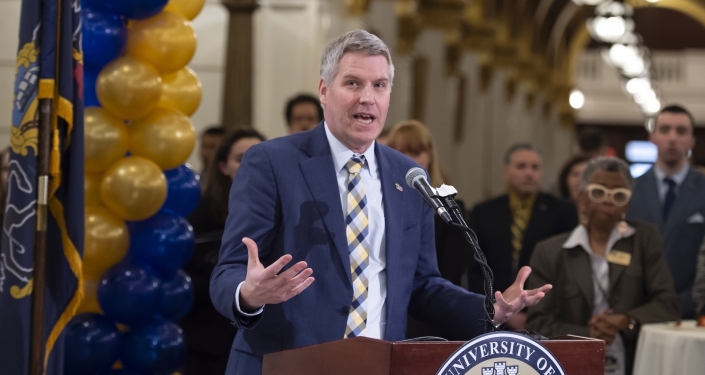 U.S. ambassador, a ’95 Pitt grad, to speak at undergraduate ceremony on April 28.